Slurpy Noodles are one of my favorite things in life! 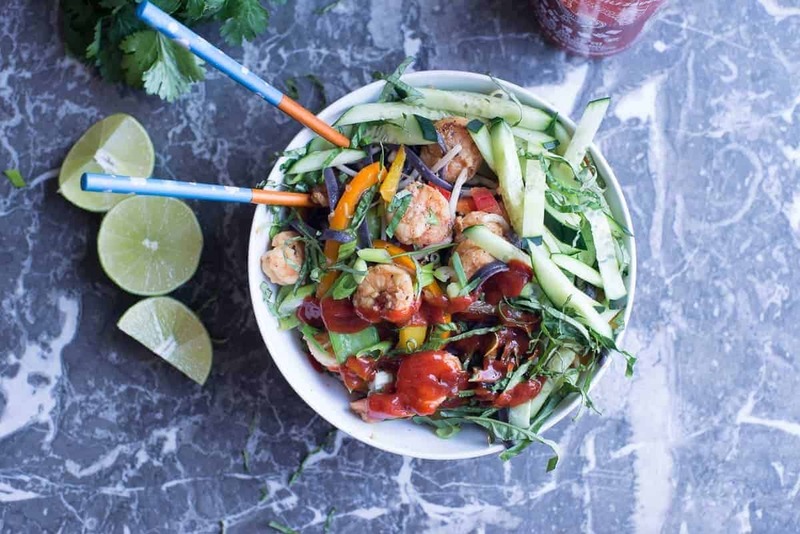 These Spicy Shrimp Noodle Bowls are colorful and packed with all the veggies, plus aromatic herbs. They’re also Vegan Adaptable. 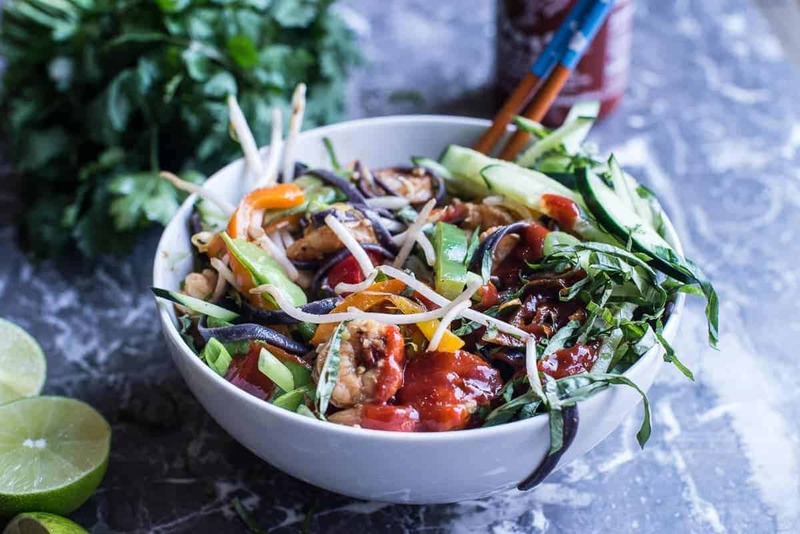 Slurpy Asian Noodle Bowls Packed with Fresh Veggies and Herbs. Completely vegan adaptable. My favorite thing about these spicy shrimp noodle bowls is the forbidden rice noodles. Life is always about moderation – and life without noodles just isn’t a happy one. Even though these bowls have rice noodles in them, they are still totally macro friendly. Forbidden Rice is a super-cool variety of black rice that was once reserved only for royalty. The forbidden rice has a higher protein content and higher amounts of antioxidants than your run of the mill white rice noodles. When cooked, these forbidden rice noodles are a dark purple color. They’re both tasty and gorgeous. A meal built entirely from inspiration. Protein packed and full of healthy fresh vegetables. This bowl of noodles is the perfect packable lunch. It’s definitely not authentically anything. The flavors tend towards Vietnamese vermicelli bowls. Vietnamese food is one of my absolute favorites. The strong flavors in Vietnamese cooking and the way warm and cold foods are often paired together make it special. There’s always a balance of flavors. Spicy is paired with cool aromatics. Hot pho broth paired with cold bean sprouts and fresh basil and lime. It is SO good. This bowl has some of these elements. No matter how you decide to categorize it for yourself, guaranteed this spicy shrimp noodle bowl tastes absolutely amazing. This seems like a lot of cooking at first but – don’t be dissuaded – the cooking is quick. If you have a wok for cooking this dish, it makes the experience even better. The key to a good stir-fry is to not overcook the vegetables. They should be cooked hot and fast and pulled out of the pan while they still have some crunch. Immediately pull the vegetables out of the pan and set them aside. Then the shrimp can go right into the steaming hot wok. The shrimp also cooks in a few short minutes. These bowls are super fun to make and to eat. I usually serve all the components on the table and let everyone build their own bowl. This way everyone gets to have a creative bowl-building experience – not to mention, they get exactly what they want! Bring a large pot or water to boil. Cook noodles according to direction and set aside. You can add a small amount of oil to noodles to keep them from sticking as they sit in the colander. Add 1 tsp of sesame oil to a hot pan or wok. Add onions, and 1 tsp of garlic, and 1 tsp of ginger. Add bell peppers. Sauté until slightly cooked. Add another tsp of oil to hot pan. Add the remainder of garlic and ginger. Add shrimp (or tofu). Sauté until cooked through. Add soy sauce or tamari and bring to a boil. Add veggies back to pan. Serve with fresh veggies and aromatics. I usually make the shrimp version and the vegan version side by side. I double the amount of veggies and noodles and then sauté the proteins in 2 separate pans. This recipe is great for leftovers.